Pablo Emilio Escobar Gaviria was the Colombian drug lord par excellence. Ruling his own fiefdom of Medellín, he first made his money stealing gravestones and ended up, through kidnapping, murder and cocaine to be one of the wealthiest criminals in history, worth an estimated $30 billion at the height of his power in the early nineties. 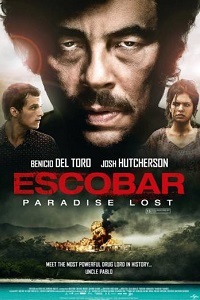 Italian actor Andrea Di Stefano has ambitiously taken on the subject for his debut movie as a director Escobar: Paradise Lost (2014) and the result is an entertaining and suitably gruesome gangster thriller which nevertheless feels like a missed opportunity. Benicio del Toro is suitably weighty and fascinating in the lead role. At once effortlessly charismatic and yet with a reptilian logic that has him not even glance out the window as a former colleague is gunned down on his orders. He is a family man with an obvious capacity for love and generosity, but murder is never far away. We meet him at a crucial moment in his career. Having become a Senator and gained massive political power with his ‘plata o plomo (silver or lead)’ policy he is now under investigation. Escobar’s solution is to have the Minister of Justice gunned down and take the country to something resembling civil war – with the police in his pocket fighting alternately against and alongside his hit men. To appease the government a deal is struck which will see Escobar serve some time and the gangster calls his lieutenants in to squirrel away his treasure. Among them is Nick (star of The Hunger Games, Josh Hutcherson), a fish out of water innocent, who is instructed to bury the money in a cave and then shoot his guide in the head. The obvious question is who is this Gringo, and what is he doing here? The first half of the film is protracted flashback to explain that. Nick is a Canadian surfer who follows his brother Dylan, played by Brady Corbet, to follow his dream to Colombia, set up a surfers’ bar and school. Blandly, and some might feel stupidly, unaware of the complexities of the place they’ve landed in, they are menaced by local thugs, but Nick meets and falls in love with Maria (Spanish actress, Claudia Traisac). She’s a volunteer at a local clinic financed by her wonderful Uncle Pablo, who “you really should meet, Nick.” And so we are taken into the cartel’s inner family, via the niece, as if we were meeting Michael Corleone via Sofia Coppola. Partly the problem here is that of trying to see a massively infamous figure through the eyes of the naïve outsider. Naivety can begin to look pretty stupid, when Nick is told Pablo makes his money via cocaine – “oh really?” – and people start to be found burned alive but the plata still doesn’t drop. It would help if there was a sense that Nick had a dark side that was drawn to Escobar, that suspected but didn’t care, but Hutcherson’s characterisation is polite, self-effacing, moral, religious, nice and – in a word – Canadian. So by the time we circle back to him being instructed to shoot someone, it seems like a part of the arc that brought him here credibly is missing. The problem with the film is punctuation. That franchise friendly colon bifurcates the movie between the utterly credible del Toro – a man who idly biros the names of people he means to kill on his hand while talking uninterrupted – and the hapless Nick. There’s nothing wrong with Hutcherson’s performance, which sees him traumatised by what he is being asked to do to survive, but ultimately he inhabits a more generic and less interesting film.